Revenue-based financing is a form of investment structured as an obligatory payback liability, where startups can repay principal back over time to their investor for an agreed-upon capped return multiple. Return hurdles, initial repayment grace periods, repayment percentages (based on, for example, revenue or EBITDA), and terms for converting to equity are agreed up front at the time of investment. With some questioning the "fois gras effect" of feeding startups excessive amounts of capital to chase hypergrowth, revenue-based financing offers a more sustainable alternative that also allows founders to retain more ownership in their businesses. 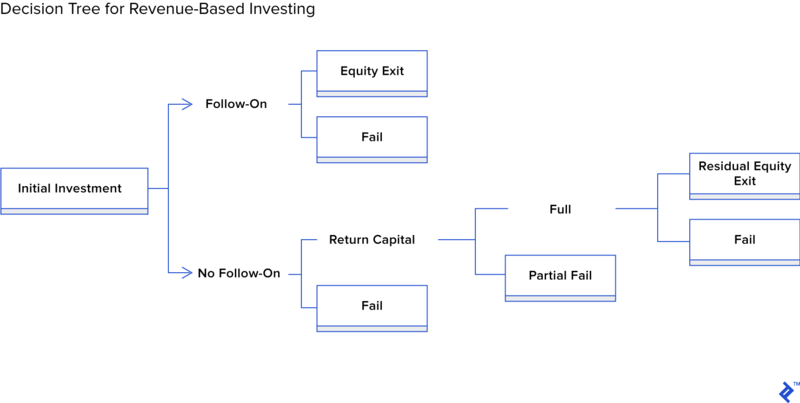 It's a model of financing that offers more options for generating returns, as investments either 1) convert to equity, 2) repay, and 3) if repaid successfully, can offer a small residual equity position. Generating revenue is the remedy to many a problem for businesses, which at times can be oft forgotten for startups. The compounding effect of continually growing revenue will, over time, provide a startup with a healthy MRR which makes the prospect of repaying a revenue-based investment a less bitter pill to swallow. For new investors who cannot compete on dealflow, this could be an interesting investment option to get eyeballs from more shrewd and experienced startup operators. It also might be a more aligned form of investing for corporates, governments/supranationals, and social impact funds. Can you play the averages over the home runs? 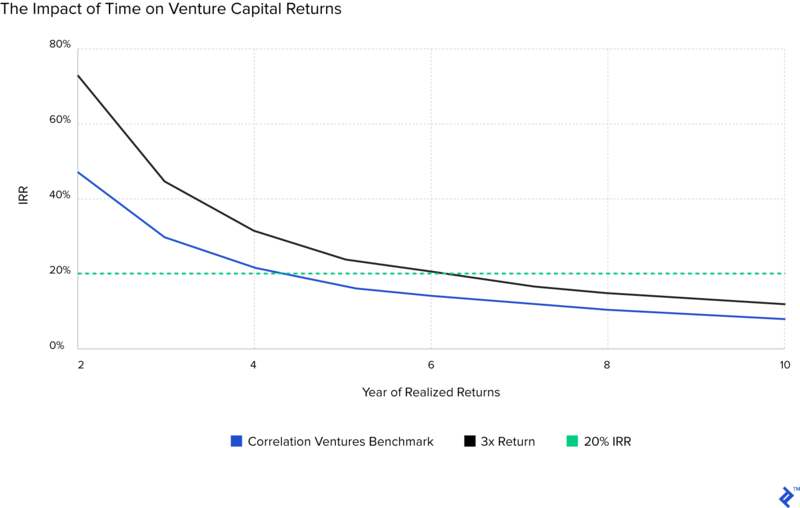 Using benchmark returns data from Correlation Ventures, the base case, median expected return (distribution to paid in capital) for a venture capital fund is 2.16x. With 3x being seen as a respectable return target, the odds are stacked against most managers, which is why many investors focus on finding unicorns (>50x returns) in order to try and make the target. Revenue-based financing is a form of investing that follows the "averages > home runs" philosophy, as the capped returns angle puts a ceiling on the returns an investment manager can expect to make. 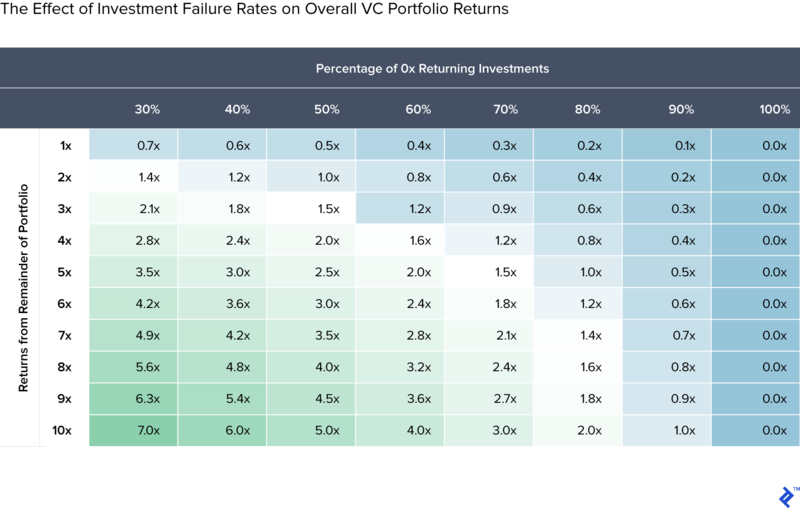 How can you mitigate losses in venture capital portfolios? Capital recycling is a useful mechanism for generating more "at bats", allowing investors to harvest returns into new investments and hope to generate more returns for the portfolio. With revenue-based financing providing more cash inflows, in our modeled scenario, reinvesting principal repayments would generate 0.93x of additional portfolio return. By design, a business model that already generates revenue will have more chances of being sustainable and thriving as a going concern, giving rise to the chance that such investments will have a lower failure rate. Investing a portfolio into verticals that have more of a proven success rate will also increase chances of success. This can be done by consistently choosing sectors that are more "necessity" than "luxury," with repeat purchase appeal in consumer and business arenas and presiding over large market sizes. This aversion has merit: one of the most comprehensive post-mortem studies on startup failure, by the Startup Genome Report, found that across 3,200 startups, premature scaling was the principal reason for those that failed. 74% of high-growth startups demised due to scaling too fast and those that did also received 2-3x more invested capital than was required during initial phases. Personally, I don’t believe that the pursuit of investing seed capital into risky startups has suddenly been outed as a deception; if anything, the negotiation dynamic has gotten fairer in recent years. It’s normal for investors to expect a measure of return and entrepreneurs should be caveat emptor to the reality that they have proverbial food to be put on the table. Education and managing expectations are key and whenever fundraisers ask me for advice, I tell them to learn the Venture Capital Method valuation formula to help them vividly see the goalposts being placed over their head. But if familiarity is breeding contempt, what can be done about it? Is Revenue-Based Financing a Fairer Alternative? Revenue-based financing was noted in the NYT article as a remedy to founders who need to raise initial seed financing but want to have their businesses’ future path plotted by their own volition. Some investors who have received attention for this are Indie.vc and Earnest Capital, the latter which uses a form of note called the SEAL. Not structured as a loan, but a liability with an obligatory payback. The liability can convert into straight equity upon an event, such as a future fundraising round. The return is stipulated as a capped multiple of the original investment (e.g., a $50,000 investment with a 3x cap results in a $150,000 total payback obligation). Payback begins at a future date and is variable based upon a percentage of an income statement metric. Once repaid, the investor may be left with a residual equity position in proportion to the initial investment. I found this to be an interesting concept and one that doesn’t seem to have any hidden intent, nor as anything that can be shrugged off by cynics as a charity/marketing gimmick. I understand that those who invest like this are probably driven by a higher purpose over just looking for returns, but for this kind of investing to increase in popularity, the uninitiated and impartial will need to be convinced of its return potential. Is there a way to play the averages in venture investing? 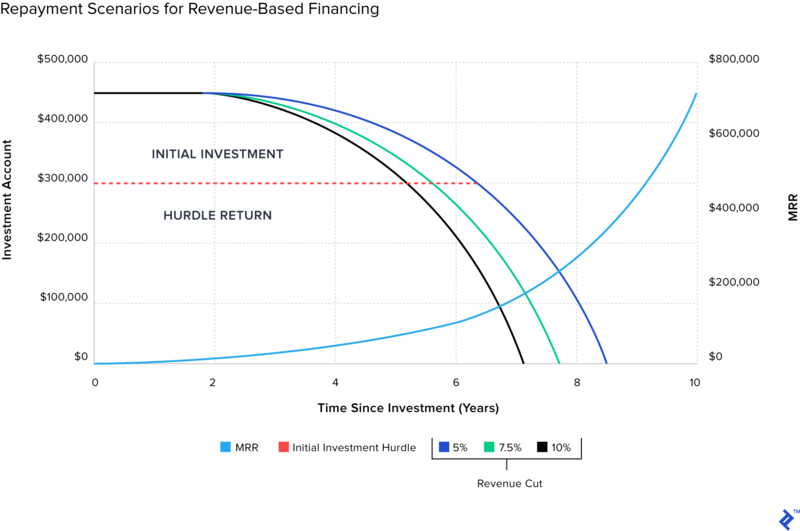 How do the returns of revenue-based financing stack up? Does revenue-based financing result in a different portfolio behavior dynamic? When I discussed venture capital portfolio strategy, the three core themes were to 1) buck the trend when appraising new concepts, 2) treat every investment in isolation and 3) go-for-broke on ones that start succeeding. I now want to revisit this to dig deeper into the portfolio management angle and see whether it’s possible to get attractive portfolio returns across a wider selection of investments. If we return to the famous Correlation Ventures data, we can have a look at how a hypothetical venture portfolio would play out if one were to invest times and receive the expected outcomes. To make this clean, I made the following assumptions 1) ignore management fees 2) use the median of the multiple brackets 3) assume it is an index and we can have fractional investments and 4) closed the fat tail at a conservative 50x (The upside of venture returns are theoretically infinite: Google bought 10,000x returns to some early investors). The multiple return (“DPI”) from this fund (the “benchmark”) would be 2.16x, which is double and change on the original capital invested. 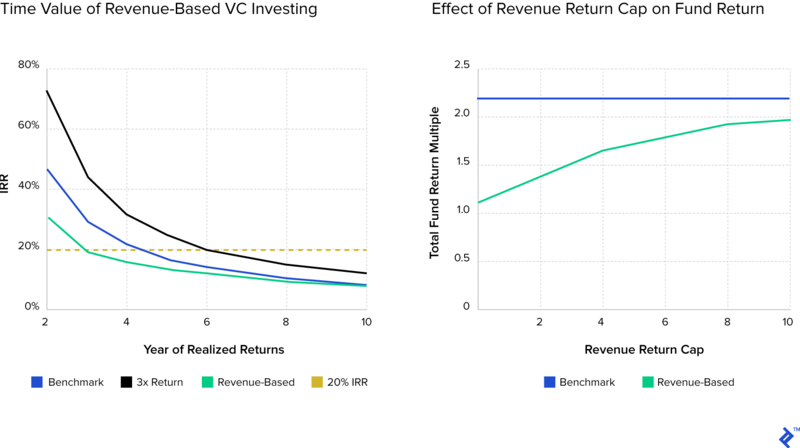 In terms of what a VC fund should benchmark for its entire return to investors, generally speaking, 3x and/or an IRR of 20% is seen as a respectable goal. In our case, the conservative 50x “unicorn bracket” weighting has a delta of 20 basis points on the overall return. So, if other variables stay constant, a 260x return would be required on the “home run” to get this portfolio to 3x. Looking at the benchmark portfolio, it already has underperformed on desired exit return multiples, but on a time-value basis, it could still meet the 20% hurdle, provided that it realizes returns quicker (if we hypothetically assume that all returns occur within the same year). Our benchmark would need four years to meet the 20% IRR target, which is two less than a target 3x portfolio. This time pressure factor demonstrates why entrepreneurs receive pressure to scale by their investors. Funds have a finite legal life (mostly up to ten years), within this timespan, investments need to grow at a faster trajectory to increase their multiple-based valuation and then be sold, or go public, to realize liquidity. This is a narrow window, and if prolonged, can end with the awkward situation of having to transfer illiquid securities to LPs, selling at a haircut in the secondary markets or indeed back to the startup for a ceremonial price. So What Happens If You Play the Averages? With startup failure rates hovering around the ⅔ mark, it’s deemed impractical to try and score small hits to shape an aggregate 3x return. There is a natural instinct and ambition by investors to try and score big wins and, in reality, once an investment is made, its destiny is out of their hands anyway. The matrix below demonstrates this necessity to unicorn hunt in order to gain a respectable portfolio return—if 70% of investments fail, you need 10x from the rest just to reach an aggregate 3x. To continue the (never-ending) baseball metaphors, going for a “slugging percentage” of aiming for more rounded returns across a portfolio is more possible in later-stage venture capital (loosely referred to as growth equity). At this point, the ship is vast and on cruise control; steering it off course, is a largely difficult thing to mess up. 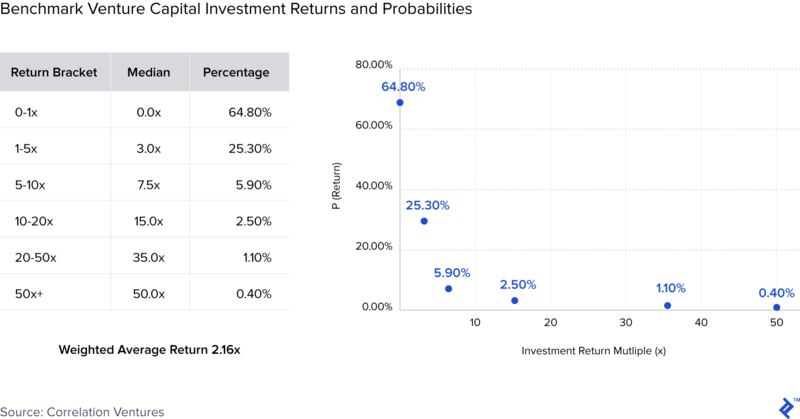 Subsequently, the returns at this stage have a smaller multiple range due to the diminished risk, but with less return variance and most importantly, lower failure rates (29%). So, playing the averages is possible if you invest later on, in less risky assets. Yet, with early-stage venture capital investing, startup outcomes are so erratic that it wouldn’t be ridiculous to suggest that most investors would say that it’s easier to focus on finding that one 50x+ unicorn over managing the entirety of the survivors to a blended returns of >7x. The high failure rate is the sticking point. How can we mitigate this? Does Revenue-Based Financing Offer Attractive Returns? Using my interpretation of the rules of Indie.vc’s open-sourced legals for its revenue-based financing structure, it presented the following decision tree of potential outcomes. Unlike traditional venture investing—which will have just one node—this revenue-based model gives rise to different financial scenarios, dictated by the first node of whether the startup raises additional funding rounds. Exits (IPO/M&A) from investments that have converted to equity. Capped repayments on principal from investments that did not convert to equity. Residual equity positions (˜10% of initial capital) that remain in businesses that have repaid principal. Now, with the theory covered, let’s have look at how this might play out in reality. Can Startups Even Afford This?! Revenue-based financing will only work if invested businesses have the capacity to repay. It may appear a daunting prospect to repay up to 3x of an investment and one that could be seen as an opportunity cost use of free cash flow. For that, such financing will only really work if the startup already is in a position to make revenue, has a long enough grace period to get some breathing space and has a repayment “cut” that isn’t exorbitant. When I mentioned this to some friends in the industry I got some laughs, mostly along the lines of, “How’s a startup going to repay 3x of its investment? !” This perhaps says more about the times we are in, where making revenue has been relegated to a curious rarity. Investment of $150,000 based on 3x of a Year 0 ARR of $50,000. Grace period of 24 months. Return hurdle of 3x, so a $450,000 total return obligation. Revenue growth of 120% Y1, 82% Y2 and 60% thereafter, as per this VentureBeat survey. Monthly revenue repayment “cut” ranges of 5, 7.5% and 10%. As you can see, in such a scenario, the investment repays comfortably within a median time frame of about eight years, with an approximate one year delta between the cut ranges of 5 or 10%. This is a conservative scenario, but one with timescales that fall inside the life of a closed-end fund. If anything, this shows the power of revenue and compounding, with $4,167 of initial MRR reaching ˜$720,000 by the ten-year point. Not only does this show how repayment of $450,000 is easily possible within such parameters, but also how a small business can grow into a lucrative one, with just a bit of time and patience. The grace period is also perfectly aligned, because, during the initial two years, the full compounding effect of revenue growth has yet to take effect, thus charging a cut here would have an immaterial effect. How Do the Returns Stack Up? We’ve seen how you can make money from revenue-based financing, but now let’s look at what you can make. 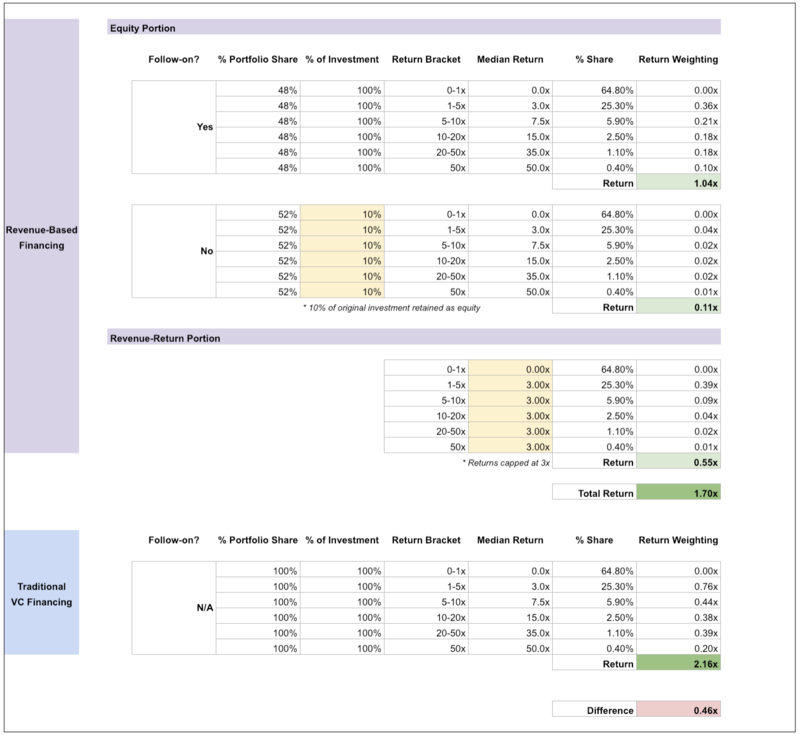 By using the Correlation Ventures return data on the decision tree outcomes, we can model up a returns scenario for revenue-based financing to compare it with the “benchmark.” In this case, I used 3x as a return cap and 48% as the ratio that straight converts to equity, due to raising a second round. In this scenario, the revenue-based portfolio would return 1.70x, which is 0.46x below the benchmarked returns. This is to be expected, as the shortfall is attributed to the capped returns on the revenue-repay side of the portfolio. The only upside over 3x received on this side of the portfolio is for the 10% residual equity positions that remain after principal repayments. Looking at the time-value of these returns, revenue-based financing has a flatter curve that converges to the benchmark at the tail, due to the effect of receiving earlier cash inflows from the repaid principal portions. Using the repayment cap as a variable to find a “breakeven” to the benchmark is almost pointless because an incrementally increasing cap will effectively “max out” the lower returning brackets of the portfolio. If anything, 3x is already optimal because it gives assurance that everything bar the failures will have the capacity to repay. 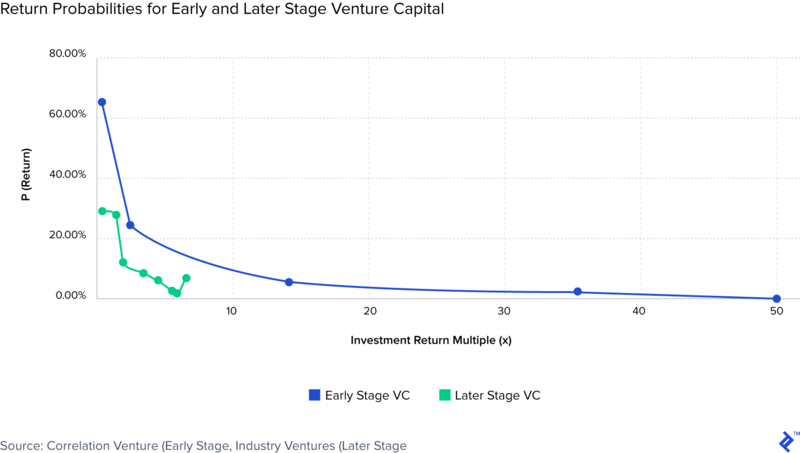 This gives us the quantitative angle, which concludes that revenue-based returns are theoretically lower than the traditional venture investing style. But it also leaves an itch that there is an interesting time-value of money component to play with here and the undoubted potential for different types of investment outcomes. What Factors Would Enhance These Returns? 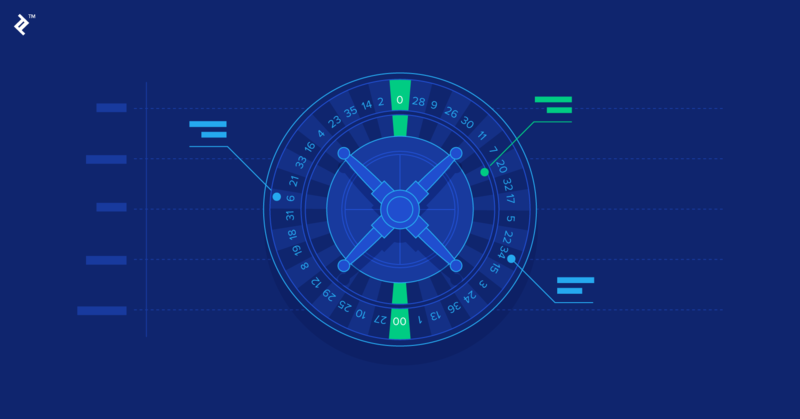 There are some known unknowns about the characteristics of revenue-based financing that might assist in lowering the failure rate of 0x deals. With deal upside capped on the repaid investments, mitigating the number of failed deals clearly is the area to focus on to ensure portfolio returns are maximized. Some VC funds are permitted to redeploy realized returns into new investments, to give more at-bats. In a closed-ended “traditional” fund scenario, the window of such opportunities can be narrow due to the time constraint of cash inflows only arriving from IPOs or M&A, which generally take some time to happen. For a revenue-based financing structure, as we have seen, there are more cash inflow scenarios due to the principal repayment schedules. Once these start to occur, the fund manager will experience regular capital inflows, albeit in piecemeal amounts. The potential for putting this money to work again is apparent. If we go back to the base scenario of the revenue-based fund, 0.55x of its return comes from principal repayments. Reinvesting this capital again will replicate the 1.7x multiplier effect, so harvesting gains back into the funnel would yield an additional 0.93x return to the total portfolio, bringing its aggregate return to 2.63x. Investing with a thesis of not looking for the next Uber/Airbnb/WeWork may actually expose an investor to an untapped and unloved universe of viable businesses. I regularly work remotely and cross paths with entrepreneurs that have successful remote micro-businesses in areas such as eCommerce, consulting, and SaaS. They might not have a desire to be hypergrowth, but the businesses usually generate cash flow from the start, through a combination of more measured expectations, MVP hustle, and leaner operations. Quantitative data to give a clue about what to invest in here is tricky as, by design, self-sustainable businesses that have not raised much money tend to not seek the limelight. But, if we look at major startup verticals and plot median levels of capital raised to median revenue, we can get some clues. Let’s have a look and clear away the outliers. No surprises to see car sharing out there on its own, but pet technology is a surprisingly lucrative industry! 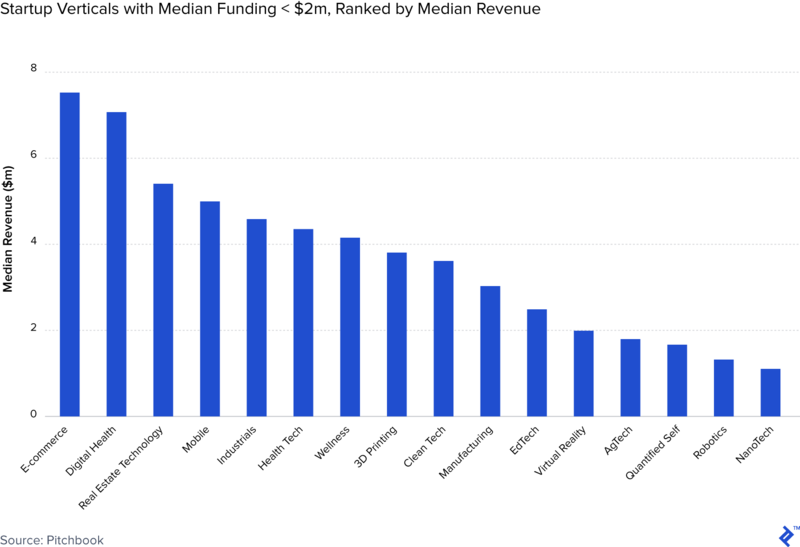 If we then dig into the bottom of the axes, in particular, those that have raised less than $2 million, but have median revenues over $1 million, we can start to take a view of what sectors might work here. 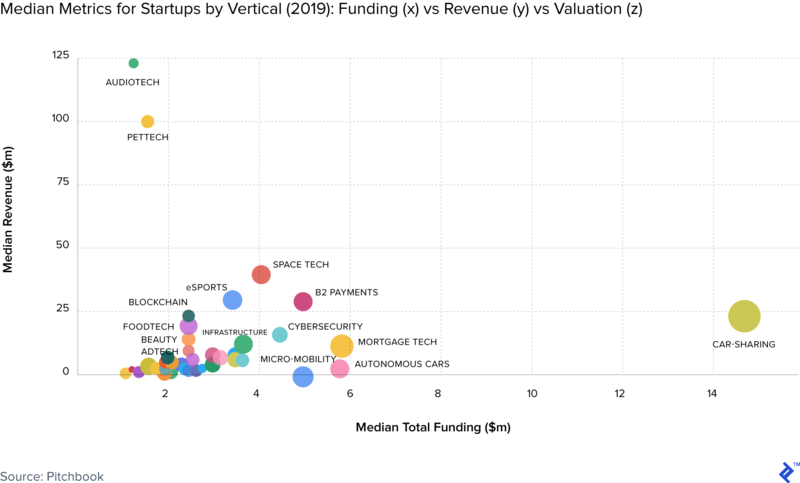 This is a very disparate group of verticals, with some that could be classed as startup “stalwarts” and others, such as nanotechnology, more niche. If I could draw some conclusions from this selection, it would be that these are verticals with repeat purchase potential, large market sizes, and more towards the side of necessity over luxury. As mentioned, there has been a general increase in negotiating leverage towards entrepreneurs that can shop deals around and pick between investors. It’s easier to tap different channels, pool intel and, for those who already have a track record of execution and/or visible traction, they can generally have their cake and eat it. Any model of financing that grants more flexibility and options to entrepreneurs, such as revenue-based financing, will start to appear on their radars. This could theoretically move an appropriate fund manager to the front of the pile for the best deals. If you blend these A+ operators with the leaner/methodical types that aren’t looking for hypergrowth, you could be left with a very interesting dynamic of portfolio composition. The investment returns multiple curves for such cohorts may conform to a more normal distribution of outcomes. I have no data for this, but it’s an assumption that has merit. As some food for thought: in our base scenario for the revenue-based financing portfolio, if the probabilities of the 0-1x and 1-5x scenarios were to switch and all other assumptions remained, the return of entire portfolio would reach the coveted 3x. What Are the Challenges of Investing in This Manner? Operationally speaking, running a revenue-based investment vehicle would require a more hands-on element in relation to collections and accounting. Clearly, it wouldn’t be run like a traditional loan book, with physical collections agents and so forth. From what I gather, repayments are handled softly and arrears are treated more like an amber light to step in and offer assistance, over an instruction to call the bailiffs. But, nevertheless, investing in this way will give a more varied cash flow profile to a fund, which will entail some heavier operational lifting to manage. It may also be a hard sell to LPs in terms of the positioning and viability of the fund. To the uninitiated, they may frame such investing as philanthropy or unambitious, neither of which is true. Thus, a clear elaboration of why this investing is an appealing sub-segment to target will be required. Hence why I wrote this article. Also, in the cold hard realities of life, there are always those looking for a shortcut and some entrepreneurs may look to try and arbitrage their embedded put option inside a revenue-based financing. A wolf dressed in a hoodie, so to say, could raise on the premise of a sustainable business plan that quickly disappears and then reanimates as a more hypergrowth-focused one once funding is secured. With regular occurrence when advising startups that are raising convertible notes, I get variations of the question, “Because it’s debt, can I just pay it back later and not let it convert?” When faced with the quandary of loophole vs. moral high ground, it’s always the latter that really pays off in the long term through the unwritten laws of karma and reputation. Differentiation and Realignment: What Investors Might This Be Suitable For? New VC investors that have a generalist sectoral-view and don’t have “celebrity.” Their ability to get into hot deals will be defined by price (paying more) and/or speed (of which luck is a large component). Revenue-based funding could be a more compelling differentiator for them. Established VC funds that want to experiment with a smaller secondary fund format to deploy different investing themes. This may offer them a wider outlook and a chance to learn from different company types. Corporate investors who are motivated more by finding new product/customer outlets over pure capital gains could invest in this way to avoid scaring startups and co-investors that they are going to meddle. So, hold the press, venture capital portfolio strategy is still indeed a game of home runs and that doesn’t look like it’s changing. If anything, the distortion looks to be warping further, with even bigger deals and bigger funds. This culture, though, has alienated some parts of the chain who want to build commercially viable enterprises but not in the hypergrowth model that runs the risk of premature scaling. Due to the lack of funding alternatives to venture capital, many entrepreneurs have ended up signing up for something that they have ultimately come to regret. The oft-maligned “friends, family, and fools” round, has served a purpose for generations, to provide initial seed capital to risky ventures, purely on the bond of trust/bloodline. Some do this through informal loans with no interest attached, let alone any equity upside. This sign of both generosity and stoicism can often make that financial obligation far more important to repay in the eyes of an entrepreneur, over providing returns to a “grow-or-go-home” type investor spending someone else’s money. Perhaps, revenue-based financing is a happy middle-ground between the two, where the goal is a respectable financial return and the incentive of a return to autonomy? Private equity (PE) funds typically invest larger stakes in older, more mature companies than venture capital (VC). PE investment targets tend to have stable cash flows and the investment is more a question of driving efficiency, over VC, where the companies are growing and changing materially. 67% of startups fail, and the main reason for failure (42%) is due to the lack of a commercial market need for the product/service being offered. Revenue-based financing is the process of funding a business with an obligatory payback liability. The investment does not convert to equity, but instead, the invested company will, after a grace period, repay the investor over time up to a pre-agreed return multiple. High growth startups are businesses chasing fast and exponential growth, typically within the area of user acquisition. They rely on an aggressive focus on marketing, especially within areas of virality and referral-based. The growth is often funded with equity raised from venture capital.